Enjoy a slice of this cool and creamy frozen dessert. 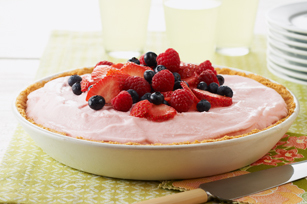 A graham crumb crust, lemon-raspberry filling and a mound of fresh berries makes this no-bake dessert a summer sensation. Mix graham crumbs and butter; press onto bottom and up side of 9-inch pie plate. Beat sorbet and drink in medium freezer-safe bowl with mixer until blended. Gently stir in Cool Whip. Freeze 45 min. or until mixture is thick enough to mound. Spoon into crust. Freeze 4 hours or until firm. Remove from freezer 15 min. before serving. Let stand at room temperature to soften slightly. Serve topped with berries. Pie can be frozen up to 24 hours before serving. When purchasing fresh strawberries, look for plump, brightly coloured berries with a strong strawberry fragrance. If prepackaged in plastic cartons, be sure to check the bottom for mushy berries or signs of mold. Choose blueberries that are plump, firm and uniform in size with a silver-frosted indigo blue colour. Avoid those that are moldy or shriveled. Store in an airtight container in the refrigerator for up to 10 days. For best results, spread out into single layer in container before refrigerating and wash just before using.